Over 16 years ago going through my CoachU certification process one of the things I implemented in a much more organized way than I’d ever done before in 16 years of fitness industry work was a community of experts. I began to clearly see how different business owners and entrepreneurs could be beneficial to each other. Not every client and customer you come in contact with wants the world to know they train with you. It’s private. They’re private. This is nobody’s business but their own. You have a confidentiality policy in place that protects everyone who feels that way. If you ask permission about sharing the contact information with someone you’re OK. Otherwise, don’t do it. You may alienate clients and lose trust. Do be aware of opportunities to connect people. You’re in a unique situation. You talk to potentially a lot of like-minded people if you niche. 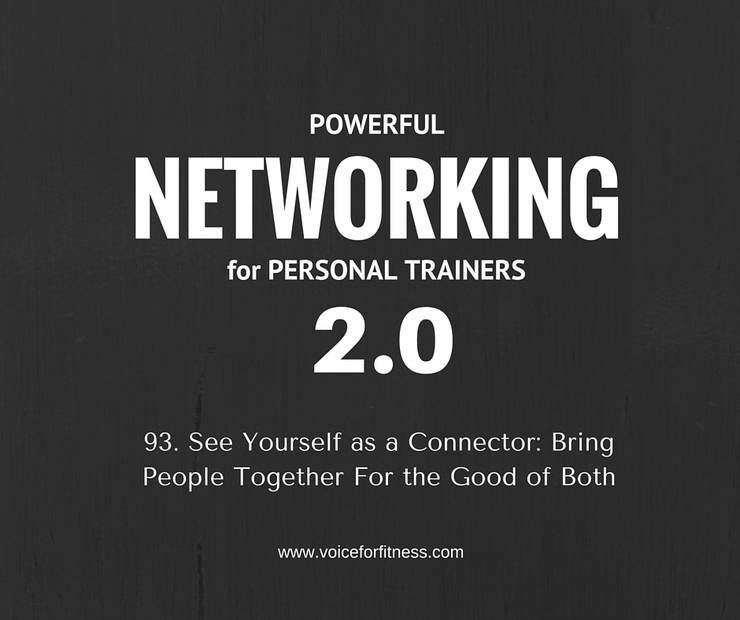 You attract a certain “type.” So whether it’s moms with school-age children, golfers, athletes, or business owners… you probably have some connections that can help your clients even outside of your fitness advice. You increase your value if you are a well-connected savvy business owner yourself this is a no-brainer.